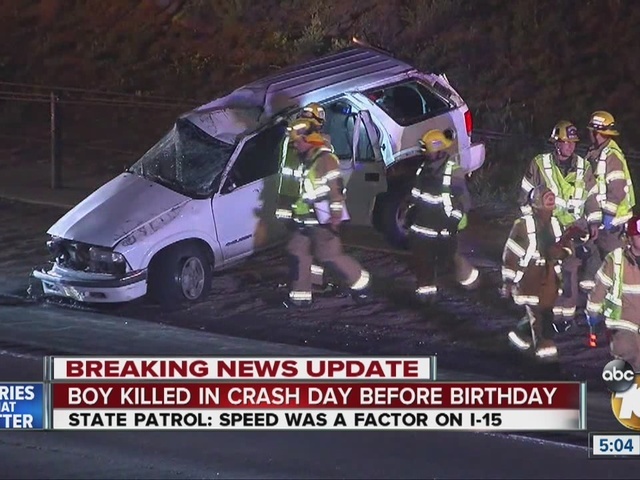 VISTA, Calif. -- An 11-year-old San Bernardino County boy was killed -- less than a day before his birthday -- and four other people were injured when an SUV was struck from behind Sunday on Interstate 15 and rolled over several times, authorities said. The 18-year-old Chino man behind the wheel of the 2013 Dodge Challenger that rear-ended the 2000 Chevrolet Trailblazer was among those injured, California Highway Patrol Officer Jim Bettencourt said. The collision occurred on the northbound freeway near Gopher Canyon Road around 9:30 p.m. The impact caused the SUV to veer into the center divider and roll. The 11-year-old Crestline boy, identified by his grandfather as Steven Lemelle, died at the scene, Bettencourt said. The SUV's three other passengers suffered minor to moderate injuries, as did the Challenger's driver, and all were transported for hospital treatment, according to the officer. The 27-year-old Crestline man behind the wheel of the SUV, identified as Steven's stepfather Richard Sanchez, was apparently uninjured. He escorted two of the victims to Rady Children's Hospital, Bettencourt said. Mark Campbell, Steven's grandfather, told 10News that Sanchez got everyone out of the SUV, but young Steven was seatbelted in the part of the vehicle that took the brunt of the impact. "His stepdad was finally able to get to him … pulled him out … and at that moment he said, 'Richard, you saved me.' … Those were the last words he spoke; and then he was gone," said Campbell. 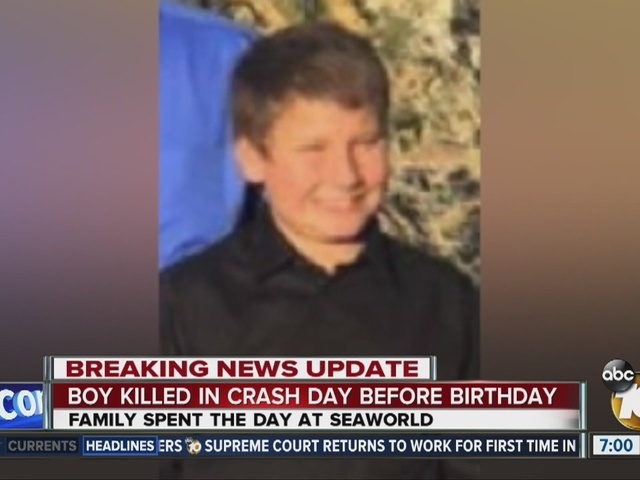 10News learned the family was in San Diego to celebrate the victim's birthday, and they spent the day at SeaWorld and ate at the young boy's favorite restaurant. They were on their way home when the crash occurred. A GoFundMe account has been established to help the family with medical bills and other expenses. Bettencourt said the cause of the crash remained under investigation, but neither alcohol nor drugs were thought to have been involved. It was initially reported that the victim was 15-years-old. That was later corrected by CHP.